My great-grandfather moved from Jerusalem to Colombia at age 20 because he heard there were business opportunities there. He went from town to town selling textiles on horseback although he didn’t speak a word of Spanish. When I was about 6, I had a watch that had a game on it. I loaned it to a classmate on weekends, and he gave me money in exchange. One weekend my mom me asked where my watch was. When I told her, she called the boy’s mother to apologize and made me return all the money. My father was proud. He said I invented renting. It was a dangerous time in Colombia in the 1980s. Every time the government would pursue the drug dealers, they’d retaliate and bomb government buildings and public places. We’d hear the popping sounds at school. My dad owned a factory that made leather goods, and when I was 9 we were glad to live in the United States for six months while he opened a distribution center in Florida. I moved back to the United States in 1994, and in 1998, I graduated from Babson College in Massachusetts with a B.A. in finance and information systems. Working as a management consultant for a while, I analyzed call centers for a bank to determine the effectiveness of its TV advertising. It was boring, but I learned about direct response marketing, which would come in handy later. When I went home to Colombia to visit, my mother would rave about a fitness class she was taking with Alberto Perez, whom everyone calls Beto, that involved a dance routine set to Latin and international music. In 1999, I created a business conference called Latin Venture with a partner, where Latin American entrepreneurs presented their business plans. I got companies like I.B.M. and Telefónica to sponsor it, and I lined up venture capitalists as speakers and panelists. We held the conference in Miami. Then three partners and I created Spydre Labs, a business incubator for Latin American entrepreneurs with ideas for Internet businesses. We raised several million dollars and invested in the start-ups we created. Then the tech bubble burst, funding dried up, and I had to let everyone go. I decided to return what remained of the investors’ money because my father always taught me that if you’re honest and respectful, it will come back to you tenfold. My parents had moved to Miami by then, and I had dinner at their house that night. My mother suggested that I talk to Beto about starting a business related to his fitness routine. He had also moved to Florida and was giving fitness classes here. He and I met and discovered that neither of us had any money. 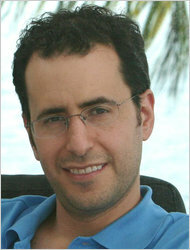 We decided to start a company anyway, and I asked Alberto Aghion, one of my best friends from childhood, to join us. We wanted to sell home fitness videos directly to consumers, so one night we set up on the beach and had a videographer film a fitness class. We started looking for joint venture partners for producing videos we could market on television. Along with a TV infomercial, the home videos introduced our concept to the public, and when people called wanting to be trained as instructors, the company took off. 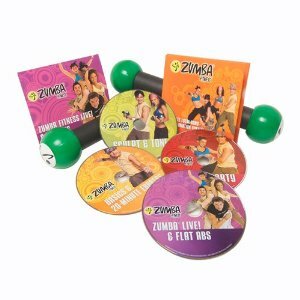 Zumba Fitness is now in about 50,000 locations in 75 countries. This year we’re introducing a game for Nintendo Wii, Xbox and PlayStation. I’ve learned that if you don’t take a risk, that’s a risk in itself. I’ve also learned that your customers are your boss. 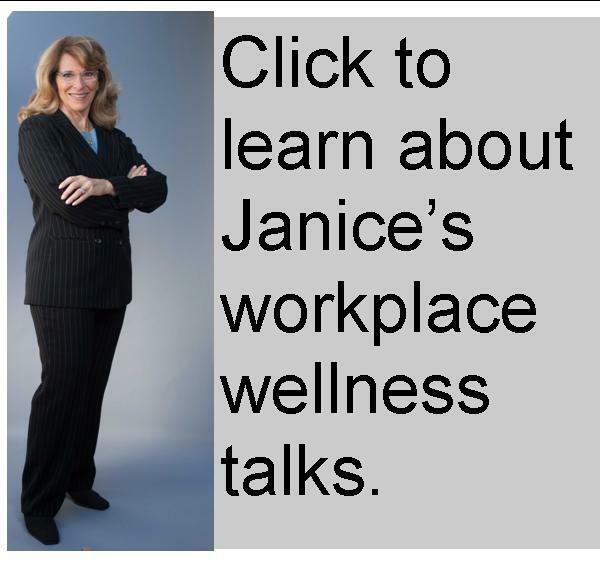 Our main customers are our instructors, who pay for training. They have their own community on our site, and I listen carefully when they tell me what we need to do in the future. 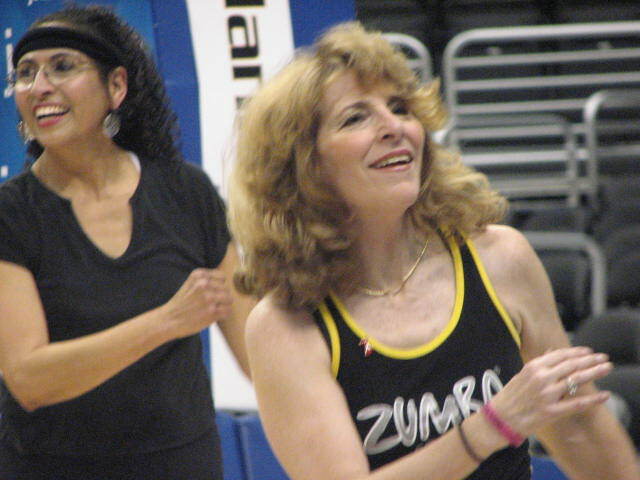 What happens when 100 Zumba Instructors show up for a Clippers basketball game in LA? Why, dance of course. And dance we did. 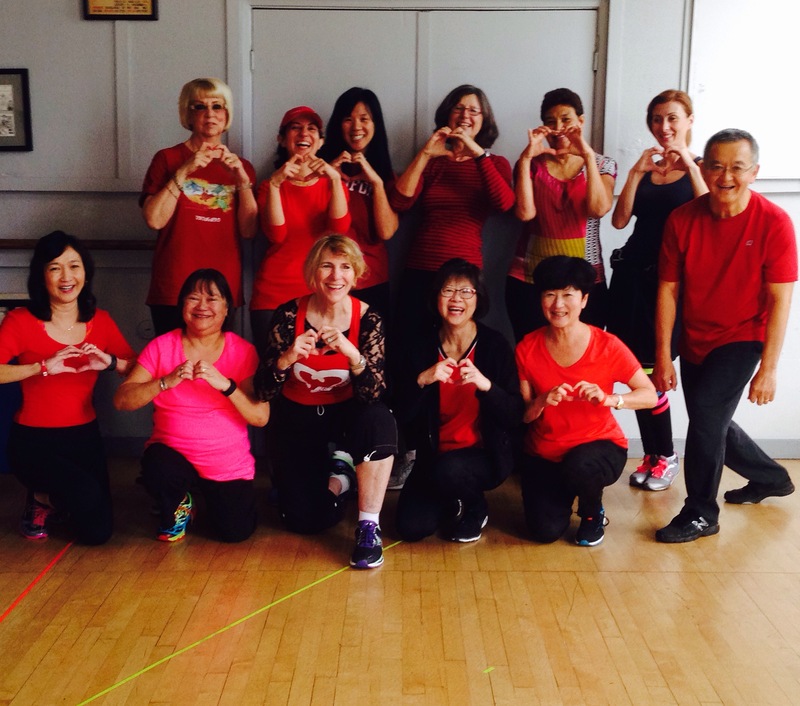 On March 6th the music played, Zumbando por Un Sueno, one of Zumba’s trademark salsa songs, and Zumba instructors who came from as far away as San Francisco, San Diego, & Tijauana, moved like a flock of graceful gazelles, perfectly in unison, to the salsa beat. 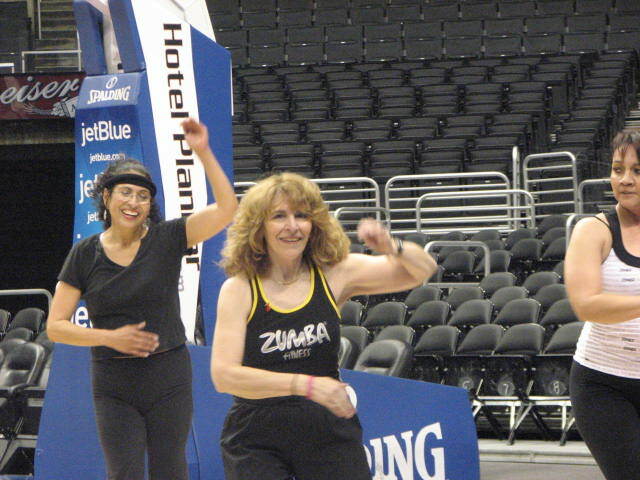 Thanks to Alfredo & Aileen Padilla who led us to this rare occasion, representing Zumba at an NBA game. Alfredo & Aileen were poised and ready when we showed up for our rehearsal at noon that day. They were so organized that they even brought their own sound system with microphone for our rehearsal. The Clippers staff were also supportive and efficient; every detail was considered and handled. Everything went off without a hitch, from where to stand to how to get there in less than 60 seconds. Once the actual performance time arrived, the thrill was so strong that we checked our minds at the gate and just swished & shimmied to the salsa beat, like we do so well. Seeing the swell of pink Zumba tank tops moving as one, in the video afterward, made the experience even more surreal. Having my husband and teen-aged son there to cheer me on and share in the thrill epitomized the event for me. Afterwards as I walked through Staples Center, home to both the Clippers & the Lakers, I felt a new, deeper bond every time I passed a Zumba pink tank top.